The teaching materials for the learning experience on “Marriage and Family” are divided into three parts. In part 1, students will study paragraphs 8.1 through 8.4 of this doctrinal topic in the Doctrinal Mastery Core Document. They will learn about the importance of marriage and family in the plan of salvation, and they will study the doctrinal mastery scripture passage found in Doctrine and Covenants 49:15–17. Part 1 also includes a practice exercise that will help students apply what they learn. Note: You could teach the segments and the practice exercise of this lesson in a single class session or over the course of several class sessions. If you choose to teach the segments and practice exercise over the course of several class sessions, you may need to briefly review with students what they learned in previous segments before you teach a new segment. Imagine that you have a friend who does not want to get married because he thinks that he could accomplish more in life without a spouse or a family. What would you say to him? “One of the great tasks of our time … is to help people understand the true meaning and purpose of marriage” (David A. Bednar, “The Divinely Designed Pattern of Marriage” [address at Humanum Symposium, Mar. 9, 2017], mormonnewsroom.org). Why do you think that helping people to understand the true meaning and purpose of marriage is one of the great tasks of our time? 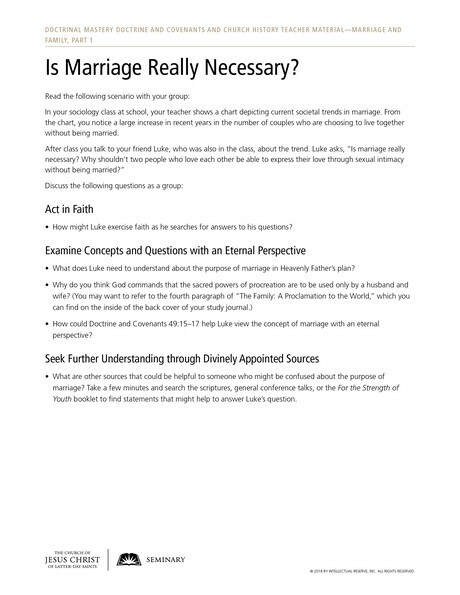 Ask students to turn to doctrinal topic 8, “Marriage and Family,” in the Doctrinal Mastery Core Document. Invite a few students to take turns reading paragraphs 8.1 through 8.4 aloud. Ask the class to follow along, looking for statements that describe the true meaning and purpose of marriage. What are some statements from these paragraphs that describe the true meaning and purpose of marriage? Refer students to the first sentence in paragraph 8.1: Marriage between a man and a woman is ordained of God, and the family is central to His plan of salvation and to our happiness. Invite students to mark this key statement of doctrine in their copies of the Doctrinal Mastery Core Document. In what way is the family central to God’s plan and to our happiness? Invite students to turn to Doctrine and Covenants 49:15–17. Explain that this doctrinal mastery passage helps teach the key statement of doctrine they marked in paragraph 8.1 in the Doctrinal Mastery Core Document. Invite the class to consider marking this scripture passage in a distinctive way so they will be able to locate it easily. To help students understand the context of this passage, explain that the revelation recorded in Doctrine and Covenants 49 was given to the Prophet Joseph Smith to help clarify some false beliefs of a member of the Church named Leman Copley. Before joining the Church, Copley had belonged to a religious group called the Shakers, who rejected marriage and believed in a life of total celibacy (abstaining from marriage and sexual relations). Invite a student to read Doctrine and Covenants 49:15–17 aloud. Ask the class to follow along, looking for truths about marriage. What are some truths that we can learn about marriage in these verses? What do you think it means in verse 16 that marriage between a man and a woman helps the earth to “answer the end of its creation”? After students respond, ask them how these viewpoints differ from the truths that marriage between a man and a woman is ordained of God and that the family is central to God’s plan of salvation and to our happiness. Display the following statement by Elder David A. Bednar. Invite a student to read the statement aloud. Ask the class to follow along, looking for how marriage and family relationships will benefit their future. “All people, especially the rising generation, need a vision of the richness of family life and its potential for developing the highest and best in each of us. In an age of increasing selfishness, we must highlight marriage’s capacity to lift men and women beyond their narrow self-interests to the joys that come from dedicating one’s life to a higher and holy purpose (David A. Bednar, “The Divinely Designed Pattern of Marriage” [address at Humanum Symposium, Mar. 9, 2017], mormonnewsroom.org). In what ways do you think marriage and family relationships can develop “the highest and best in each of us”? In what ways have you seen family relationships produce joy or self-improvement in your own life or in the life of someone you know? Divide students into small groups. Provide each group with the accompanying handout. Give the groups time to discuss the questions on the handout, and ask the students to be prepared to have someone from each group share some of their group’s findings with the class. In your sociology class at school, your teacher shows a chart depicting current societal trends in marriage. From the chart, you notice a large increase in recent years in the number of couples who are choosing to live together without being married. How might Luke exercise faith as he searches for answers to his questions? What does Luke need to understand about the purpose of marriage in Heavenly Father’s plan? How could Doctrine and Covenants 49:15–17 help Luke view the concept of marriage with an eternal perspective? What are other sources that could be helpful to someone who might be confused about the purpose of marriage? Take a few minutes and search the scriptures, general conference talks, or the For the Strength of Youth booklet to find statements that might help to answer Luke’s question. After students have had sufficient time to review and discuss the questions on the handout, ask a volunteer from each group to report on what their group found. Ask one or more volunteers to report on what their group answered for the “Examine Concepts and Questions with an Eternal Perspective” questions. Note: The following review activity is not intended to be taught during the same class session as this lesson—“Marriage and Family, Part 1.” Please present this activity during a seminary class session that takes place after you have taught this lesson, but before you teach “Marriage and Family, Part 2.” This short review can be taught at the beginning or end of a class in which you teach a regular sequential scripture lesson from the Doctrine and Covenants. Be sure that this review takes no longer than five minutes, so as not to take away from the scripture block students will be studying in class. Before class begins, invite a student to study Doctrine and Covenants 49:15–17. Ask the student to determine five of the most important words in the passage. Invite the student to come to the front of the room and write on the board the five words that he or she chose. Ask students to guess which doctrinal mastery passage in the Doctrine and Covenants these words came from. Once the class has identified the scripture passage, ask the student at the board to explain why he or she thought these five words were some of the most important in the passage. Ask class members to find other words in the passage that they think are important and to explain why. Renaissance of Marriage (2:35)—Hear what President Henry B. Eyring of the First Presidency says we all must do to have a renaissance of happy marriages and productive families. Consider showing this video to help students understand and feel the truth and importance of the following doctrine: Marriage between a man and a woman is ordained of God, and the family is central to His plan of salvation and to our happiness.